In 1977 Atari was flying high with its 2600 game console, a (way distant) forerunner of the Playstations and Xboxes of today. However the rise of the personal computer, as flagged by the Commodore Pet, TRS-80 Model 1 and the Apple II, didn't go unnoticed by the company. Atari recognised, rightly, that while these gadgets in the home could be useful for balancing chequebooks, keeping recipes or perhaps writing the odd letter (assuming you could afford a printer back then), one of the big uses was going to be computer games. As they were masters of the computer game business, a cunning plan was devised; Why not build two related computers? One could take on the Apple II, but also plug and play cool cartridge games (the Atari 800). The other, a cheaper model, could be marketed as a games machine but could also masquerade as a real computer (with a kid-proof keyboard) if needs be (the Atari 400). It was a brilliant move, and in 1979 both units were released into an enthusiastic marketplace. Atari was up and running as a personal computer company! In New Zealand these machines are RARE, although they were sold here in the early 1980s. They are iconic early home computers. When I first got hold of the Atari 400 it was dirty, neglected and untested. I was sure it wouldn't go and was fully expecting to have to repair and restore it like many of my other units. Imagine my surprise when I plugged it in and it went first time! An even greater shock awaited me when I tried the membrane keyboard. Every key worked! They are obviously rugged little beasts, these 400s. In saying that, it's misbehaved once during its time with me, requiring some intervention. The BASIC cartridge was the only thing that accompanied the 400 but since acquisition I've amassed lots of Atari gear so it's well-stocked. Here it can be seen playing Asteroids. 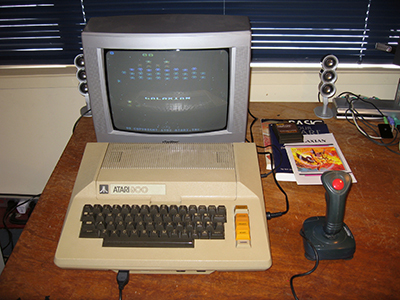 The Atari 800 was purchased years later. It was clean, undamaged and worked first time. The full-stroke keyboard means it's physically larger than the 400 although the unit as a whole was smaller than I expected. I guess I'm used to late 1970s models having built-in power supplies which adds to their size. Unlike the 400 it has a composite video output, which negates the need to "tune" the TV into the right channel. The unit is an NTSC variant but a UAV video adpator means it works with PAL just fine. This 800 didn't come with a power supply but luckily the 400 and 800 use the same type of adaptor so at least I can have one or the other powered up...just not both at the same time! 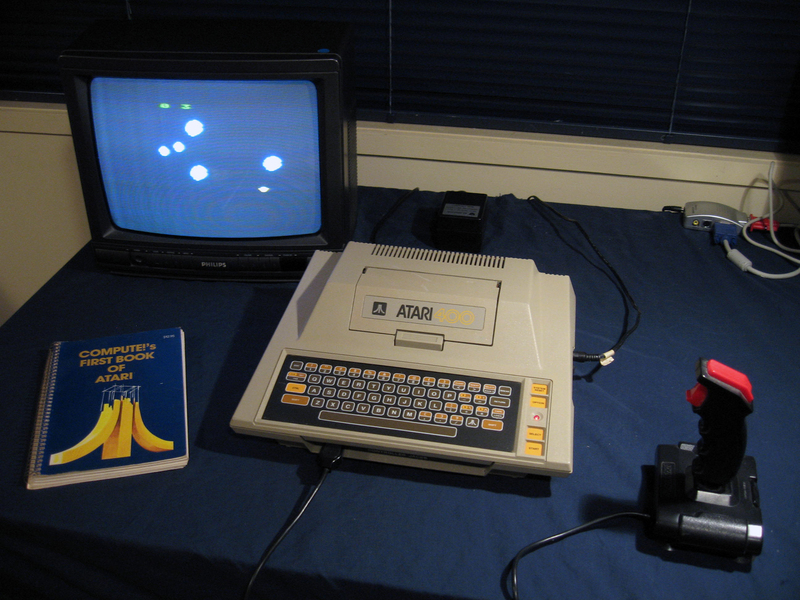 My impressions of the Atari 400 and 800 are very favourable. I'm stoked to have both models. It would have been so cool to own one of these in the day. Solidly built machines, a long RF cable to bring it well back from the home television, clear video, good sound (for 1978-1980) and oh, so retro-looking with their beige futuristic cases. How can you not love them!